Disney’s A Wrinkle in Time is an adaptation of the 1962 children’s novel by Madeleine L’Engle and tells the story of pre-teen Meg. After her scientist father disappears, three peculiar beings, Mrs Who, Mrs Whatsit and Mrs Which, arrive to send Meg, her brother and friend to space in order to find him. There have been many attempts over the years to bring the novel to the big screen, but it has proved to be a difficult transition, with a 1979 Stanley Kubrick version being shelved and an underwhelming TV movie in 2003. Disney gives it a real go, but unfortunately the movie disappoints. The young hero, Meg, is played by Storm Reid. Her character is set up well and Storm does a good job with the role, particularly during the more emotional scenes. The companions that accompany Meg are Calvin, played by Pan’s Levi Miller and Charles Wallace, played by Deric McCabe. Calvin appears before the journey begins, but doesn’t have much of a reason to join them and the character isn’t given much time to be fleshed out. Charles Wallace however, is just irritating. Maybe this was down to the script or to the acting, but the character doesn’t work and should have been done better. Mindy Kaling, Reese Witherspoon and Oprah Winfrey lend their talents to Mrs Who, Mrs Whatsit and Mrs Which. They are intentionally strange and suit the tone of the film. They are played well, but there isn’t much known about them. 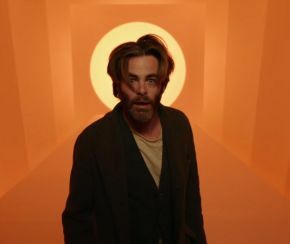 Star Trek and Wonder Woman actor Chris Pine is Meg’s missing father Mr. Murray and he is easily the best part of the film. His scenes are performed well and deliver on the much needed emotion. The chemistry between him and Storm Reid is perfect and really give the film some weight. The story at surface level is about Meg finding her father and a tale of light against dark, but there is so much more to it. It deals with space and time and has a deep theme about love. But the film just feels too short and skims a lot of the backstory and doesn’t give the characters enough time to properly bond. It would have benefitted a longer runtime. Visually, this is a stunning looking movie. It’s bright and colourful in the day and dark and scary in the night, creating a good contrast between the light and dark. The costume design works well with the scenery too. In every scene there is something eye-catching. Selma’s Ava DuVernay is on directing duties and she is a fantastic choice. Early scenes focusing on Meg’s life are well made and establish her character well. There are plenty of scenes that expand the scope of the world too, such as a fifties era street full of kids bouncing basketballs in unison until their mothers call them back in. There’s a lot of ideas and imagination on display, but sometimes it becomes too much. The story never stays in one place long enough to connect with each location and many things appear briefly but never appear again or carry any significance over the plot. The effects are used well, but at times they become noticeable, such as Mrs Which who stands at 50 foot during her first appearance. A truly good highlight is a sequence showing a field of brightly coloured flowers that gossip about rumours. The main antagonist is the physical manifestation of darkness, known as “The It”, and no it doesn’t have any red balloons. The It is a large mass of black mist, voiced by David Oyelowo, that infects the people of Earth with despair, jealousy and negativity. It’s a great concept that works for the story, but visually it doesn’t work. The effect that the It has over people is shown at one point and that scene is genuinely good. The It doesn’t need to be shown drifting over the planet. Just seeing the effects it has on people is enough to establish the threat. The editing can become annoying, with many scenes chopping down conversations to the most important parts. These scenes don’t flow well and it cuts out any moments that could round the characters and give them more personality. This reinforces the need for a longer runtime. The score is composed by Game of Thrones and Iron Man composer Ramin Djawadi. The score is great and fits well with the film. The choice of songs that appear throughout at various moments is strange and doesn’t work the same way as the score. Overall, this is a disappointing adaptation with a few good moments. This had the potential to be a new classic from Disney and an epic tale that people of all ages could enjoy, but it unfortunately doesn’t live up to it’s potential.